Meanwhile, the TMNT have gotten disoriented from the blast in the previous issue. The lads head down the passageway where the rats are streaming from, as they believe it to be the direction home. As the Turtles walk, the rodents begin swarming around them. Just as the TMNT decide it’s time to whack some rats, a strange being comes into view… a man dressed in tatters who calls himself the Rat King! 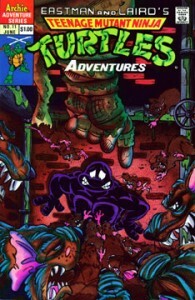 Leo answers the Rat King’s questions and the murky monarch tells the TMNT where to find Shredder. The ninjas follow RK’s directions and eventually come to where Bebop and Rocksteady were buried… only to find that they have been removed by a very powerful force. The lads continue along and find evidence of Shredder, until they run into some sort of Super Foot Soldier standing guard in the sewer. The robot is quite deadly and gives the TMNT a run for their money, but Mikey saves the day with two well-thrown shurikens. The Turtles find an open manhole cover and make their way to the surface. They find themselves in Shredder’s headquarters… but as they close to investigate voices, they are apprehended by 5 strange aliens and held in suspended animation. Bebop, Rocksteady, Shredder and Krang are all reunited and gloat over their victory. Cut to the Bayou, where we see the old witch Mary Bones watching the whole event through the mysterious crystal ball known as the Turnstone. The woman is disheartened to see Krang here on Earth and wonders how he has gained control over the aliens, who she names as the Sons of Silence. Mary decides that she must depart the Earth, and uses the Turnstone’s powers to revert to her true form. As she disappears into the ether, she states that she will not be leaving alone… and we see the Turtles dematerialize from Krang’s grasp! Krang announces that the Turnstone and Mary have returned to Dimension X… no doubt with the TMNT in tow. The villains gather their things and head for Dimension X in their spacecraft!